We look at Vacheron Constantin's entry into the competitive arena of the luxury sports chronograph. Vacheron Constantin overhauled its entire line of sports watches in 2016, not just restyling the Overseas but also endowing the range with new, in-house movements. 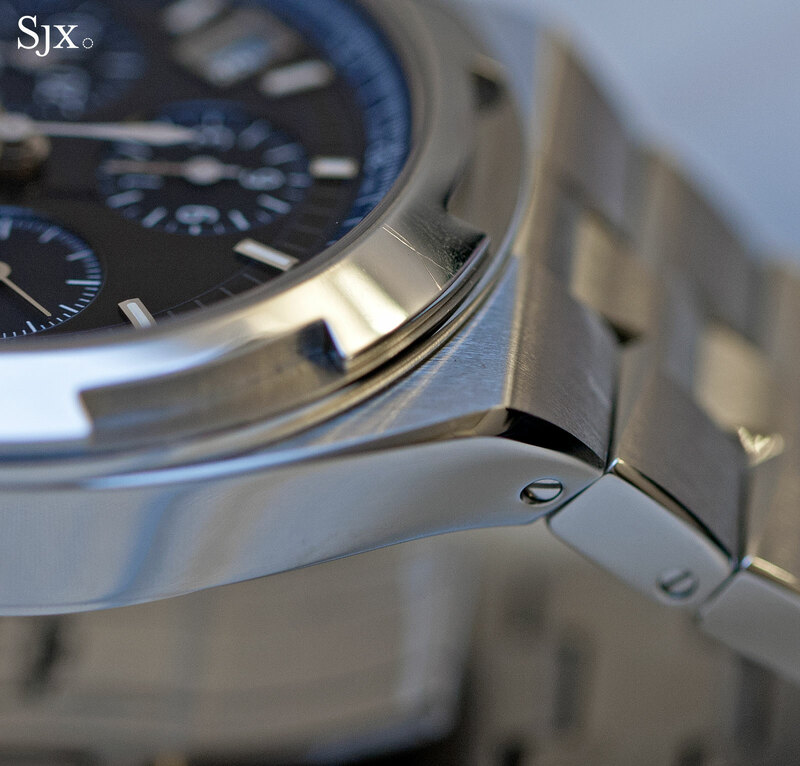 Arguably the sportiest of the new range is the Overseas Chronograph (ref. 5500V), the largest watch of the line that’s powered by the calibre 5200. Vacheron Constantin’s latest is a contestant in a brutal arena, with rivals like Patek Philippe Nautilus Travel Time ref. 5990 and Audemars Piguet Royal Oak Chronograph, and to a lesser extent Richard Mille, that dominate the ring. The bar is set high. Lots of attention has been put into the styling of the new Overseas, which manages to look different while sticking to the familiar form of past versions. Much of the detailing, however, is subtle enough to go unnoticed on first pass. At 42.5mm in diameter, the Overseas Chronograph is big enough to look and feel like a sports watch on the wrist; though the Overseas World Time is larger, the chronograph looks sportier. It’s not immediately apparent but the case sides rise outwards, so the bezel of the watch is larger than its footprint, which enhances the perception of size – not a bad thing in a sports watch. Though new Overseas retains the signature notched bezel of the line, the case shape is more ovoid than round, which gives it a slight seventies vibe. 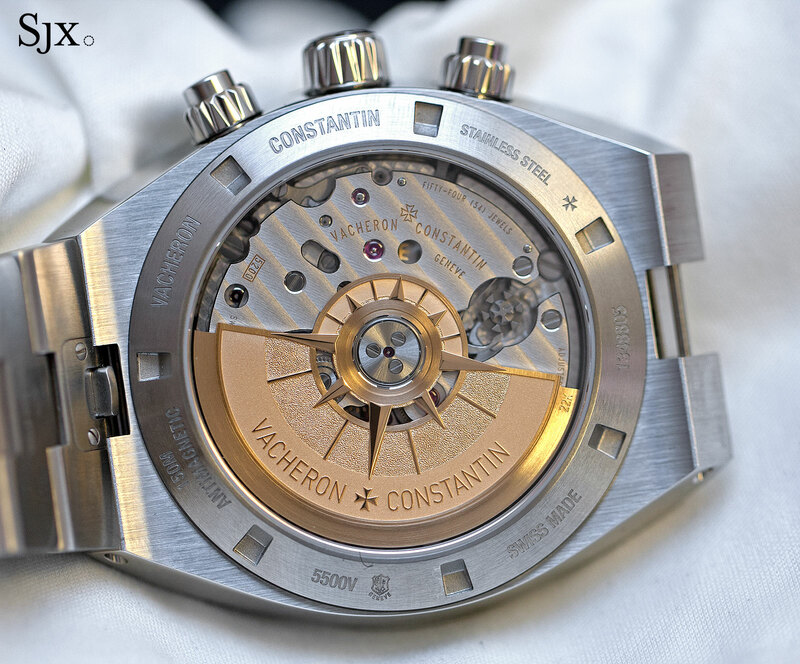 While the bezel is an obvious nod towards the arms of the Maltese cross, the logo of Vacheron Constantin, less obvious are notches in the screw-down crown and pushers that sit at an angle, also being inspired by the arms of the Maltese cross. Looks aside, a luxury sports watch has to be nuanced and refined. The case of the Overseas Chronograph manages this, with neatly brushed surfaces that insect with wide, polished bevels on the edges. The contrasting surface finishing of the metal continues with the bracelet, with each link shaped like an arm of the Maltese cross. That being said, the Overseas case is not quite as complex as that of the Royal Oak. 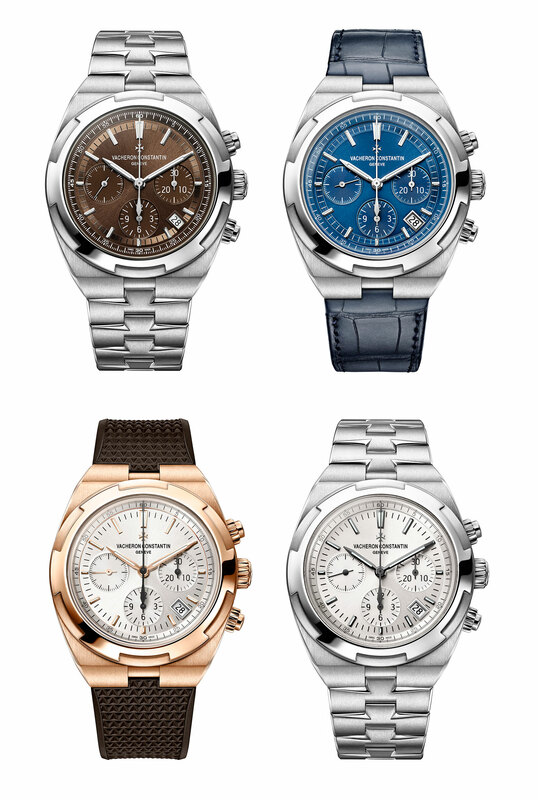 Three dial colours are offered for the Overseas Chronograph, with the easiest to like being the deep blue. The colour works well with a sports watch, and is executed with a glossy, slightly translucent lacquer that gives the dial a mirrored effect at certain angles. And depending on how the light hits the dial, the shade of blue changes from dark to bright. That being said, though the blue dial seems to be the archetype for this genre of watch, the chestnut dial is the most eye-catching of the lot. A rich brown shade with a metallic finish, the chestnut dial shades red and even purple at certain angles. A more detailed story on the chestnut chronograph will be forthcoming. The dial design sticks to a well worn route, no risks were taken but the dial is handsome. One advantage the Overseas Chronograph has over its siblings in the line-up is the utility of the outermost minute scale with hashmarks for a quarter of a second. The prototype pictured show hashmarks for a fifth of a second, which is incorrect. The production watches have quarter second hashmarks. That is functional, since the chronograph can record up to a eighth of a second, running at 28,800 beats per hour (that’s eight beats per second). On the Overseas watches without chronographs, the extra minute scale looks superfluous since there’s no elapsed seconds hand to stop. The calibre 5200 is Vacheron Constantin’s first in-house automatic chronograph, with all the features associated with modern, high-end stopwatches: the start-stop of the chronograph is controlled by a column wheel, while the power transmission relies on a vertical clutch. The calibre 5200 a largish movement, measuring 30.6mm in diameter, which helps give the face balance by allowing the chronograph registers to sit closer to the perimeter of the dial. Fortunately, it is also slim, being 6.6mm high. And the calibre 5200 has twin barrels for a 52-hour power reserve. 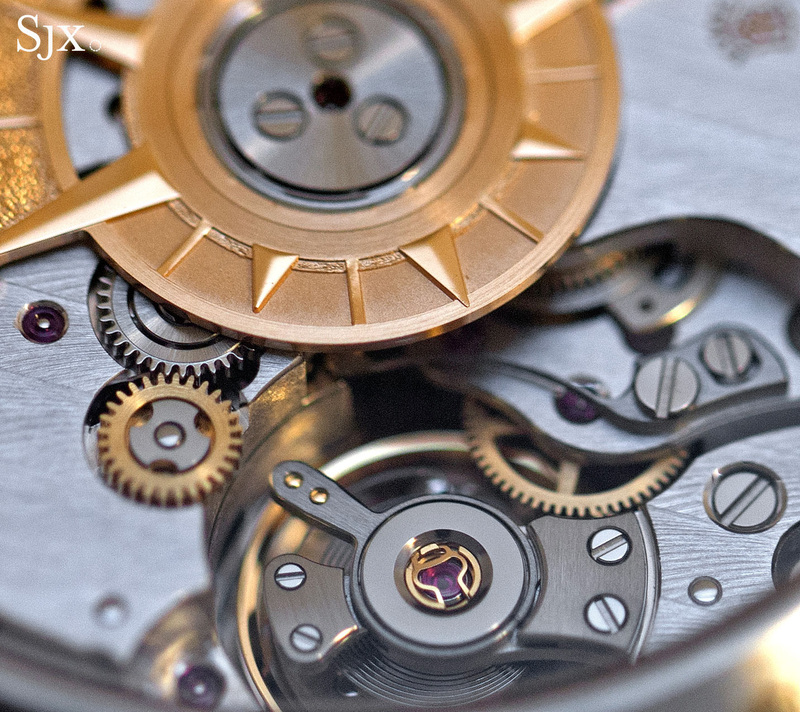 Though the movement is quite large, the chronograph components like the column wheel and levers are comparatively small. That’s because the calibre 5200 is built on the self-winding calibre 5100 in the Overseas Automatic (ref. 4500V), necessitating a compact layout. Most of the movement is hidden underneath large bridges, though details like the relief compass rose on the rotor and Maltese cross column wheel are attractive. While the features pass muster, the movement is not particularly beautiful from a design perspective. 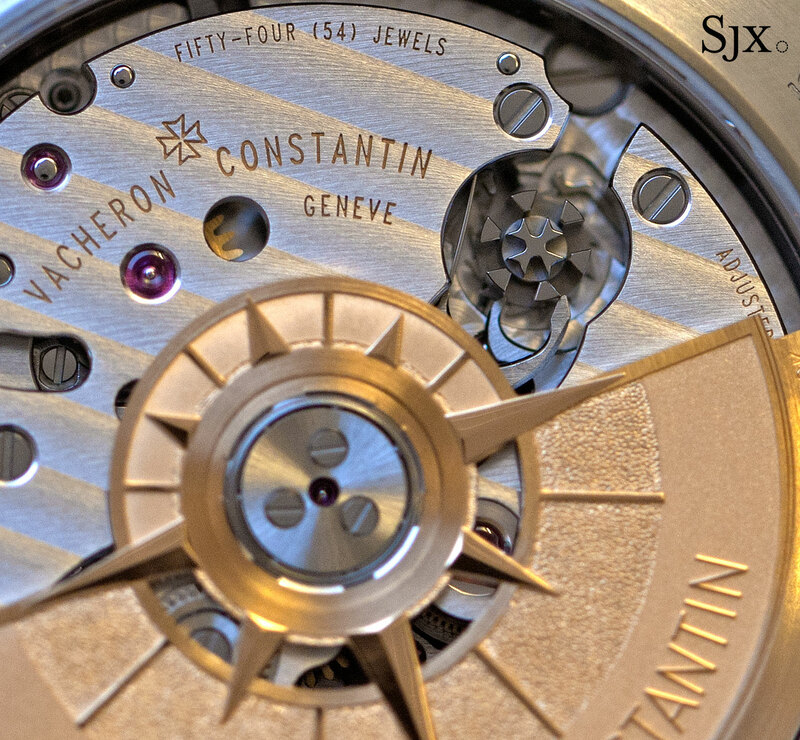 Up close the movement decoration is pleasing, and meeting the criteria of the Poinçon de Genève, or Geneva Seal. That means the decoration is neat and consistent, with most done by hand, sometimes with a bit of help from a machine. Put simply the finishing is on par with competitors in the same genre and price range. Notably, the in-house movement is a big plus in its favour when compared against the Royal Oak Chronograph, which still relies on the sophisticated and compact Frederic Piguet calibre 1185 made by Blancpain. 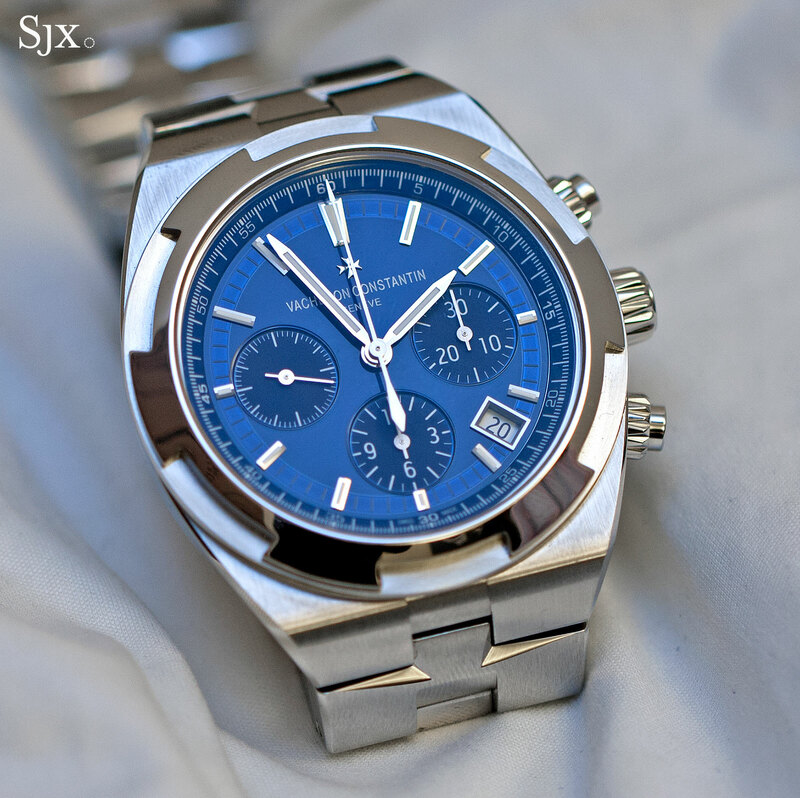 The Overseas Chronograph is very good, ticking all the right boxes. In terms of tangible features and quality it holds its own against the competition. But because the competition is so entrenched, dislodging them requires an monumental, exceptional timepiece. The steel version is packaged with three strap options, rubber, alligator and a steel bracelet, while the rose gold model is supplied with only rubber and alligator straps. Like all the watches in the Overseas range, the chronograph has a quick strap change mechanism – pull a tab on the back of the bracelet and it comes off. 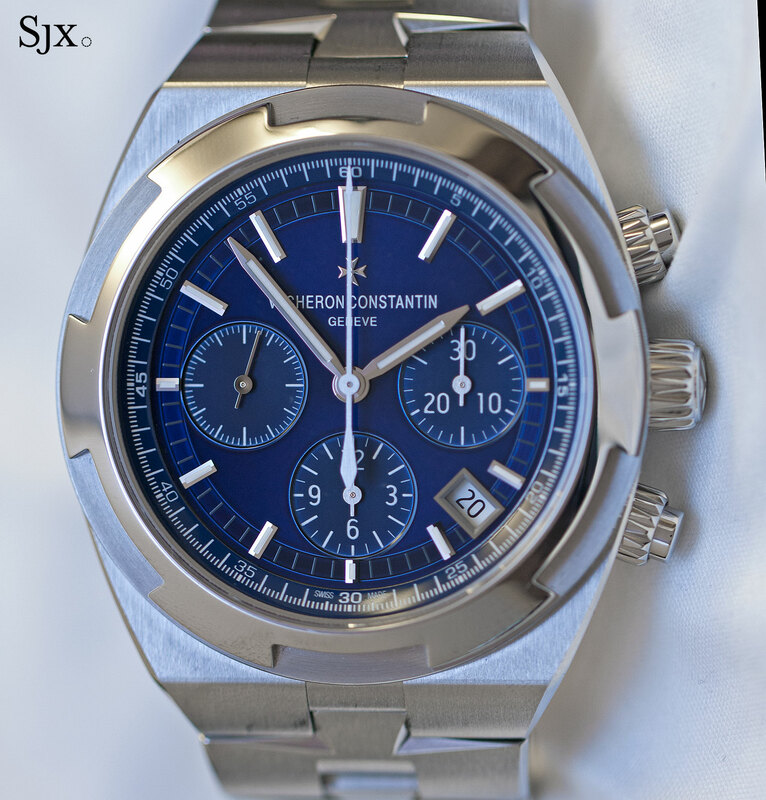 The Overseas Chronograph is priced at US$28,900 or S$44,500 in stainless steel and US$49,000 or S$75,500 in rose gold. That puts it right in the middle of the price range, with the Royal Oak Chronograph priced about 17 per cent less, while the Nautilus Travel Time costs twice as much (surely worthy of a discussion on value for money). 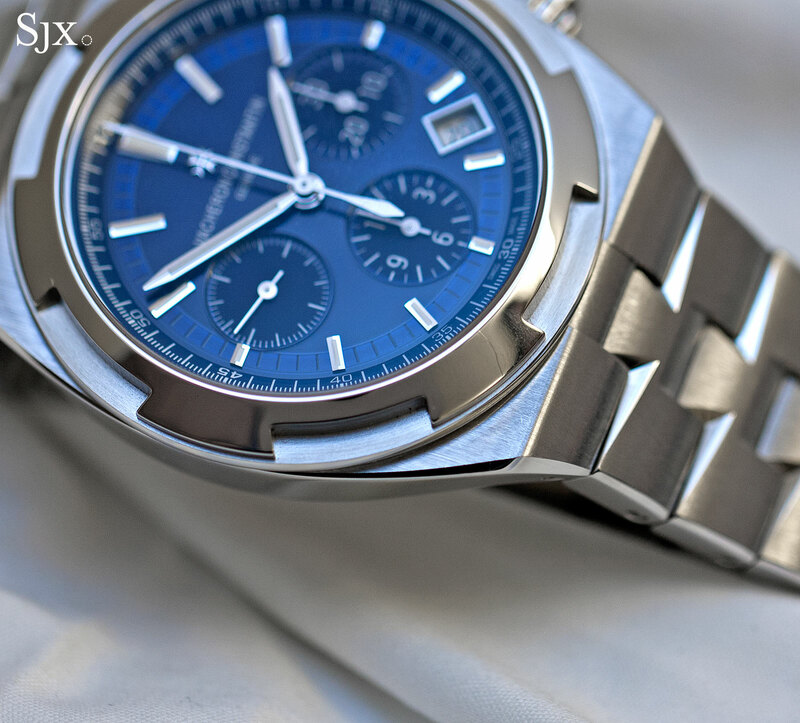 While it still costs a large sum of money, the Overseas Chronograph is positioned equitably since it’s equipped with an in-house movement, which the Royal Oak lacks, but does not have any other complication besides the chronograph and date (the Nautilus has an extra time zone, but justifying the price is another matter). 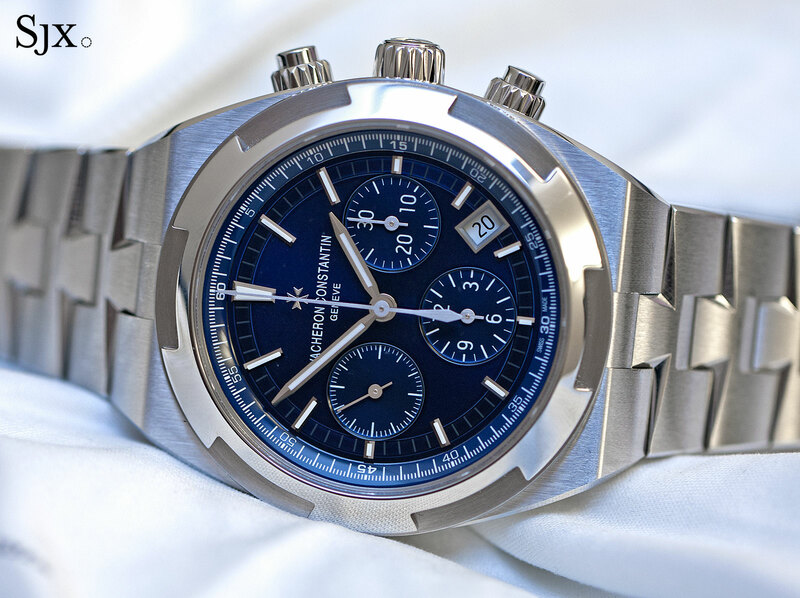 The Overseas Chronograph is available from Vacheron Constantin retailers. Correction August 23, 2016: Included explanation of the hashmarks for the seconds scale on the dial, which will be marked for quarter seconds on the production version.